After several sunny days we woke to rain – which was a bit of a surprise. We had to paddle across the camp site to the shower block but at least the camper van was washed. Heading towards Rotorua we had to negotiate another of the rather scary single track road/rail bridges but the rails looked rather disused so I think we were spared the prospect of being run down by a train. At Kawerau we stopped to stock up on supplies, but once again there was no coffee shop! The town is a centre for wood products and is surrounded by forest. What isn’t grown locally is trucked in on the huge logging trucks with equally huge trailers. It was obvious when we reached the outskirts of Rotorua as we could smell the sulphur emanating from all the thermal activity in the area. Once settled on the camp site at lunchtime we made light work of the growing laundry collection and then enjoyed a relaxing time in the natural hot tubs – light drizzle meant that we had them to ourselves. The next morning we headed into town and explored the Thermal Park – minimal health and safety, just common sense and a few warning signs – and saw steaming pools and bubbling mud. 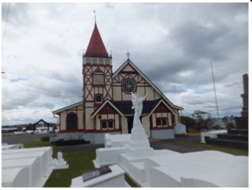 After lunch we discovered St Faith’s Anglican Church, built on a peninsular known as Muruika that juts into Lake Rotorua. On the site of a heavily fortified Maori pa, the peninsula was the burial ground for ancestors. The steamy, bubbling pools around here remind us that the area is unstable and that the last palisades of the pa disappeared into the lake in the 1960’s. Invited by the local chief, two missionaries were invited to the area and the first Christian service was held here in 1831. Much work was done to teach literacy and put the Gospel and business papers, including the Treaty of Waitangi, into Maori. The first church was built of Kauri wood in 1885. Ihaia Te Ahu, a local tribesman who grew up at Kerikeri (Bay of Islands) with the lay missionaries, was appointed the first vicar. 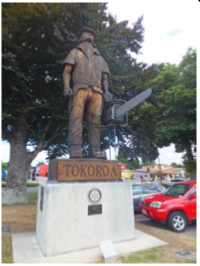 He was known as “the hero of missionary effort” in Rotorua. The whole church is lovely and I would recommend using Google to find out more and see pictures (I also have a booklet). We were made incredibly welcome by two ladies who were on meet and greet duty. St Faith’s is surrounded by traditional Maori buildings, including a meeting house. Soldiers of Te Araw lie in a burial ground by the lake and, like the vaults in the churchyard, are all above ground – a unique solution to the problems of being on geothermally heated ground. You can’t miss that fact as the drains steam and a crack in the road was leaking hot water! An afternoon of heavy rain put paid to thoughts of sitting in open hot pools and gave us concerns about our evening plans. Fortunately the weather cleared and we were waiting at the camp site entrance to be picked up by our bus driver (self-styled Dennis the Menace) who kept us entertained with jokes and songs on the trip to Tamaki Maori Village. Here our appointed leader (a very nice Canadian who originated from Glasgow) was chosen to accept the welcome token after the tribe had greeted us. 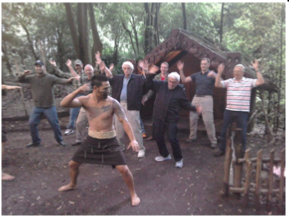 We were introduced to Maori customs and traditions – the men being invited to learn a Haka and the ladies risking life and limb with the Poi dance (swinging balls on strings). After being entertained by the villagers with lovely singing and dancing we had a delicious hangi meal – meat and vegetables cooked on hot rocks in an earth oven. Dennis returned us to the camp site, encouraging us to sing songs from our various homelands and finishing with “The Wheels on the Bus” – surreal! His rugby, cricket and Aussie/Pommie jokes are unrepeatable. The following day we set off early, in lovely sunshine, and headed southward to the Waimangu (Black Water) Volcanic valley. This is an interesting place as it is the only hydrothermal system in the world formed within historic times. It was created in 1886 as a result of the Tarawera Eruption when Mount Tarawera erupted, leaving a chasm 4 miles long and 820ft deep and burying the famous Pink and White fan-like silica terraces which were acknowledged as the 8th wonder of the world. Several Maori villages disappeared under mud flows and 153 people were killed. A thriving tourist attraction, including a hotel, were wiped out in 1917 by an eruption that formed the Frying Pan Lake – the world’s largest hot water spring. 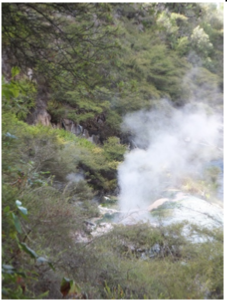 Today one can take a 90 minute, 4k walk through the area, admiring hot springs, mini geysers and silica fans forming on the way to Lake Rotomahana – formed in the eruption and covering the Pink and White terraces. As an added bonus there is a shuttle bus that will return you to the car park. Taking State Highway 5, we continued southward to Taupo and found a pleasant camp site with ducks and rabbits for company at Acacia Bay, on the shore of Lake Taupo. To get there we had driven through an area called Vaucluse with roads named Carpentras, Luberon and Ventoux – rather appropriate as our summer holiday destination is the Vaucluse, not far from Carpentras and under Mont Ventoux in Provence! We enjoyed exploring Taupo, including a shop called the Man Cave, and discovered the Robert Harris coffee shop (last visited in Nelson) where we know there is good wifi. Colin replaced his worn out sandals with a pair of Croc jandles (flip flops in Kiwi). We returned to Robert Harris the following morning in order to enjoy their Eggs Benedict again. State Highway 1 took us along the lake side to Turangi through lovely scenery. Here we turned back to return north again, diverting a short way to the Tongariro National Park. 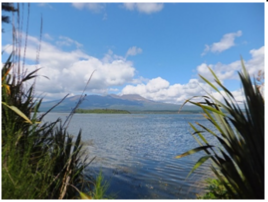 On the banks of Lake Rotoaira we stood, surrounded by dragonflies on the site of an ancient Pa, and admired Mount Tongariro – aka Mount Doom and the Plains of Gorgoroth to Lord of the Rings fans. Our lunch stop was at Tokoroa, another wood and paper centre surrounded by forestry that was in various stages of growth and harvesting. The town is famed for its ”Talking Poles”. These are a range of wooden art installations with historical and modern themes. This statue recognises the work of the woodsmen. Our next port of call was Tirau, a small town famed for its corrugated iron structures. The tourist information centre (behind the figure) is housed in a “sheep dog” and the wool shop in a “sheep”. 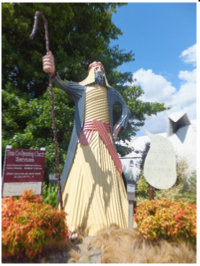 The church has a huge corrugated statue – his speech bubble declares “Being good will not get U 2 heaven. Believing in Jesus Christ will!” Shops have corrugated signs and the residents obviously have a great sense of humour. From here we headed to Matamata and the Opal Hot Springs camp site where we were able to relax in hot pools and swim in a full size, thermally heated, swimming pool. Bliss. The current church on this site was dedicated in 1914 and was designed to be in keeping with other buildings in the town – with Gothic/Victorian tower and a rather Elizabethan looking exterior. The inside is beautifully decorated in the Maori style with fabulous carving and geometric woven panels of tukutuku. The Sanctuary window shows Christ knocking on a door – a reproduction of the Holman Hunt painting, The Light of the World. The whole place is a wonderful mix of Maori and European styles. The original wooden church was moved next door and served as a Sunday School until it was blown down in a storm in 1936. In the 1960’s the church was extended to accommodate larger congregations and east and west chapels added. The Galilee chapel is home to the most beautiful window. 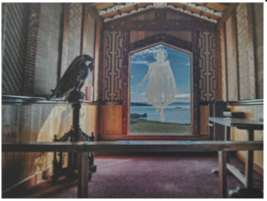 A plain glass window is etched with the image of Jesus wearing a Maori korowai (cloak) appearing to walk on the waters of the lake.